Are We Too Busy For Great Marketing? If you’ve been reading my columns on Convince & Convert lately, you’ll notice that I am covering JetBlue quite a bit. From a better wingman, to ads so good you want to steal them, JetBlue has been on a roll – and there seems to be no end in sight. While I typically like to mix my columns up to cover different companies, JetBlue’s latest campaign struck a chord with both Jay and me. Called, “HumanKinda,” the campaign addresses something many of us can empathize with—feeling too busy. To bring the concept of HumanKinda to life, JetBlue took a unique approach by partnering with director Bianca Giaever and host Sam Richardson to create a documentary just shy of 16-minutes long. In the documentary, the stories of two extraordinarily busy people are shared, including a single mom named Jennifer with a never-ending to-do list and Ryan, an entrepreneurial guy who has 8 jobs. As viewers get to know about their lives and stories, you cannot help but understand the downside of being too busy. In addition to the video, JetBlue also created a dedicated Tumblr page appropriately named jetbluehumankinda.com, which hosts a series of meme and GIF style content that support key points around what being too busy is doing to our happiness. The company also offers a quiz to uncover your level of “HumanKinda” and is encouraging fans to share their stories with #toobusy to keep the campaign momentum going. So, what can you learn from this marketing campaign/PSA? JetBlue is dedicated to bringing humanity back to air travel. While there are many topics the company could develop marketing campaigns around that are more focused on travel, the strategy of delving deeper into the theme of humanity is an interesting one. Not only is it highly topical and relevant, but it offers a platform for the company to reach a broader audience of potential passengers. Being “too busy” is clearly a barrier to traveling for fun and JetBlue’s ability to develop a campaign celebrating the importance of humanity under the lens of a bolder, relatable message could inspire its customers to change their ways. While there are many schools of thought around the optimal video length, I’ve always been of the opinion that the quality of the story, variety of shots and key message points should determine that for you. Releasing a documentary video that is almost 16 minutes is a bold move for a company. However, the story arc and the way the video is cut and edited keeps the viewer’s attention. I found myself immersed in Jennifer’s and Ryan’s stories and wanting to see how they ended. The video also offers a good reminder that an engaging, charismatic host can also drastically change the quality of the video. Host Sam Richardson was fantastic and hit the right mix of serious and fun to keep the viewer’s attention. JetBlue was smart to feature the stories of two extraordinarily busy people. Although their stories are different, they are both very relatable. It personally struck a chord for me when Jennifer said, “I’m chasing this idea that someday I’ll have it all together. And, I guess, maybe I actually won’t.” What started out as a laughing and joking moment suddenly turned more serious and something I think many of us can relate to. Instead of preaching a message or point, featuring a true story adds a level of credibility and emotion that can move and motivate us. In watching the stories, it also reminded me of how important it is to take time for yourself. While jetting off on vacation or checking out for a day can seem daunting, do we want to look back on how busy we were, or on the experiences that make the hustle worthwhile? 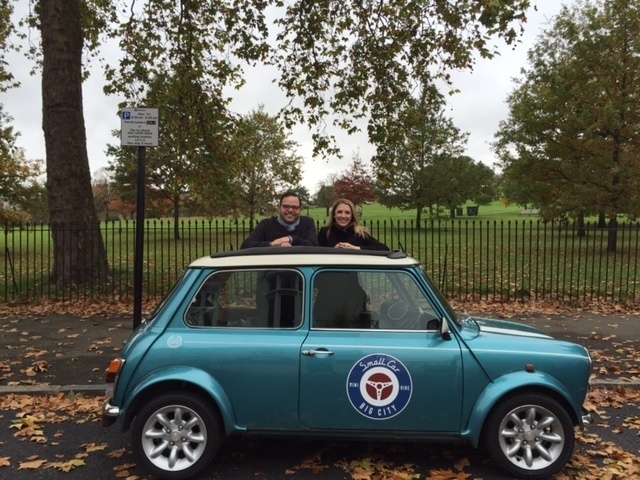 If my recent day zipping around London with Jay in a Mini was any indication, I’ll take the experiences over #toobusy any day!